According to the American Academy of Allergy, Asthma and Immunology, from 2000 to 2005, the cost of treating allergic rhinitis almost doubled from $6.1 billion (in 2005 dollars) to $11.2 billion. Yet, an inexpensive, natural and effective alternative exists to the traditional decongestants, anti-histamines and steroids used by the some 10% to 30% of all adults and 40% of children who suffer from allergic rhinitis. Nasal irrigation or washing with a saline solution, practiced for hundreds of years, is gaining renewed interest because it is natural, safe, inexpensive, and as recent research has shown, effective for relief from allergies and in reducing the need for expensive medication. Nasal washing, traditionally conducted with a neti pot, can be problematic for young children and not possible with infants. 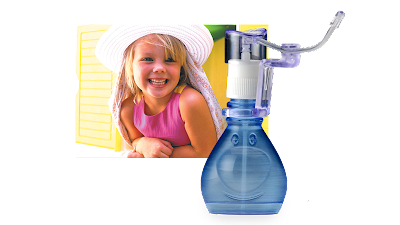 To address this, Dr. Heatley has developed for use in young children and infants, Kids Mist™, a spray bottle producing an ultra-fine mist of saline solution that is easy to aim and that does not require touching the inside of the nose. With the recent discovery of harmful ingredients in over-the-counter children's cold and cough products, it is more important than ever to be able to give your child an effective remedy that is safe and natural. SinuCleanse® Kids Mist™ provides safe and immediate sinus relief, naturally. As a mother who has the hardest time wiping, dapping, aspirating etc. I was happy to try SinuCleanse® Kids Mist™. The bottle is cute and the spray is really easy to use. It doesn't work upside down though. Dexter fought me and fought me when I came at him with it so my husband had to help me hold him down but once I sprayed the mist, he didn't fuss at all. I managed to get 2 sprays in each nostril and after minutes the boogies that fell from him nose were no longer green!! I cannot wait to use the Adult Sinucleanse. Unfortunately allergy season is upon us but Sinucleanse is here to help. A 3-week supply retails for $14.99 at can be purchased at CVS, Kroger, GNC, Amazon and Walgreens. You can also order them HERE. 3 lucky winners will win a 3-week supply of Sinucleanse Kid Mist. All you have to do is tell me why you need this product and who it will help. I will use random.org to select a winner on May 10th at NOON EST Good Luck! For an extra entry, become a new follower of mine on Blogger or Twitter (or both). Well it's either teething or Isla's sick again. It seems like she gets colds left and right. We'd love to have this!! I am entering this for myself and for my daughter. And also because I myself am a netti pot and sinus cleansing and sprayer user, and many people come to me to ask me about help for sinus probs. would love to review this product. I follow you at twitter. My son often suffers from nasal congestion. This could really help him. Thanks for the giveaway! This would help my daughter as she has allergies and is frequently congested and has a stuffy nose. This would be a better alternative than what we have used in the past. this would help both of my daughters, as they are both just now getting seasonal allergies. poor girls. this would actually help ME a lot. I have terrible allergies and congestion and as a result i get nosebleeds very often. This is something i would definitely use. This would help my niece who is having sinus. She is using 10packets of tissues everyday! It would help my daughter's congestion - that's what I need it for. My little Wesley gets all stuffy at night and it can make it hard for him to sleep well, not to mention that it breaks my heart. My niece is always stuffy. I think this would help out a lot. My niece has horrible allergies, perhaps Sinucleanse would help!